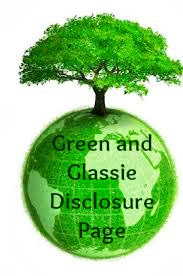 Green and Glassie: Which one are you? I have come to the realization that opposites do attract. Take my hubby and myself...we are totally the opposite. 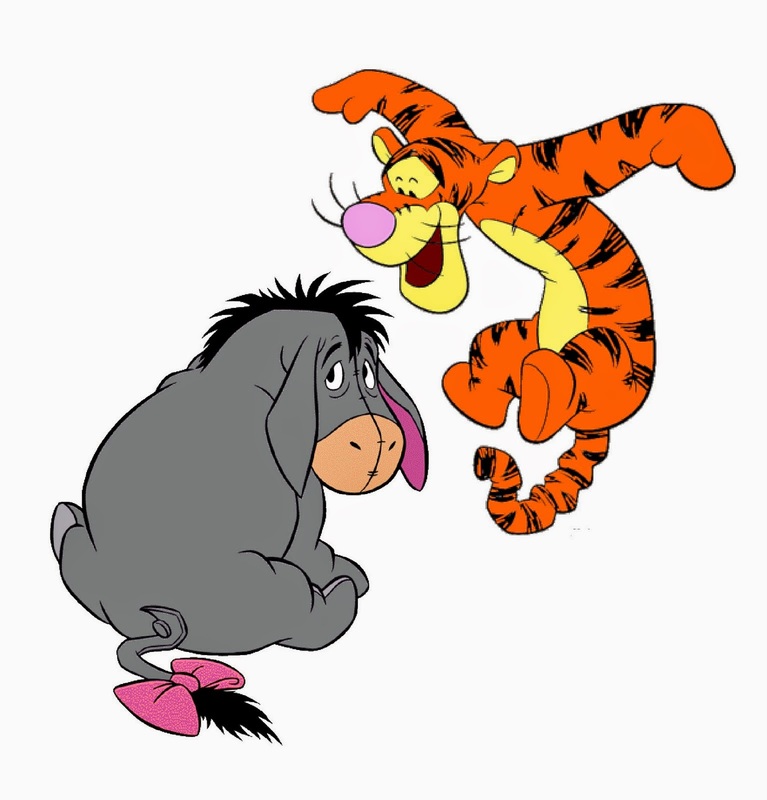 I refer to us as Tigger and Eeyore! Yep that is us! My hubby is a doom and gloomer ... while I am all fun and games. My glass is always over full and sometimes really gets me in a mess while his is empty and the water well is dry. I have to admit that some days we wear on each others nerves but we always love each other. We seem to even out each other...he brings me down to the real world and I soften his sharp edges and show him that life is good. I think the Winnie the Pooh story has been instrumental in helping me deal with so many different personalities in my life. Never once in the stories do they NOT accept each other for who they are. They all stay true to their personality knowing that their friends accept them for being them. The story Winnie the Pooh is a perfect example of the people in the real world...we are all very very different - no one is always right and if we listen and watch we can always learn something from our friends and loved ones. Isn't that what love and friendship is? I am definitely the Tigger in our relationship, too! What I really love about Winnie the Pooh stories is exactly what you said: acceptance! They love one another (all the characters!) no matter what their faults or quirks are! What a great message! 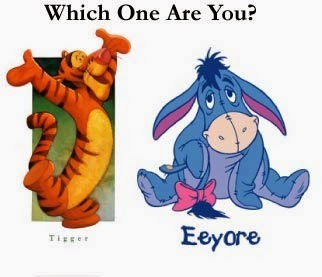 lol I am definitely the Tigger in our marriage! When hubby was laid off during 2010 (for the whole year) he would sit at our desk and stress over everything and would turn around only to find me making faces at him. However, I knew he was a keeper when one night before we were even engaged he was trying to be serious and I was spinning around a basketball pole. Just going around in circles. He asked me if I could be serious for one moment. While still spinning I said nope. We will be celebrating 11 years this August lol. I'm more the down to Earth now, but before having 9 kids I was definitely the happy go lucky bouncing Tigger! Think I would be a tigger also.